Are you ready for the next big thing in insulation clothing? Well it’s here! RefrigiWear has taken our Softshell Garments to the next level – Extreme Softshell. When we use the word extreme, we aren’t kidding. With a comfort rating of -60°F, this is our warmest insulated jacket and bibs. We took our very popular Softshell Line and upgrade it to withstand extreme conditions. We started with our durable softshell fabric, doubled the insulation and added many warmth-retaining features to give it over 500g of insulating power. In short, you are going to be warm…exceptionally warm. When you combine our wind-resistant, water-repellent outershell with the micro-fleece inner-shell, you get protection from the elements. 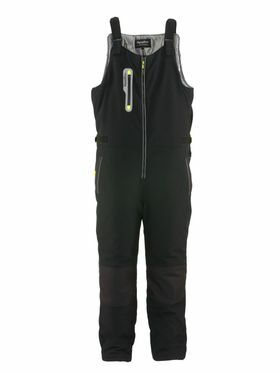 But we didn’t stop there; we added an adjustable inner waist seal for draft protection, along with thumbhole cuffs on sleeves to create an even better wind seal. The thumbhole cuffs are those little surprises you get when you slide your hand out a sleeve and causes most people to get excited and say “Oh yeah! Thumbholes!” The cuffs can also slide inside of a glove to provide the ultimate defense against the cold. Feeling warm? We expected that. 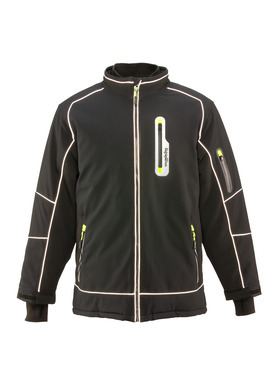 The jacket has a dual front zipper system to regulate temperature. What that means is there is an outer and inner zipper. Just unzip the outer portion for airflow to cool off, leaving the inner zipper closed to still provide protection from the cold. The softshell material is super-breathable, allowing you to be warm without sweating. This is important because we do not want sweating – that affects your ability to stay warm. The Extreme Softshell Jacket and Bib provide more than warmth, however. They are “extremely” comfortable as well. The insulation is form fitting and snugs up to your body, giving you a greater range of motion and comfort. No one wants to be like Ralph’s little brother in The Christmas Story – “I can’t put my arms down.” There is an adjustable waist, suspenders and pant legs on the bibs providing the perfect fit. These features make Extreme Softshell one of the most comfortable ways to protect yourself from intense cold. Both the Extreme Softshell Jacket and Bib have plenty of room to hold your necessities with five pockets, including a waterproof pocket on the chest of each garment. The bib also features rugged scuff-resistant knee and heel reinforcement patches, adding to the life of the garment. Throw in the safety-enhancing reflective piping and HiVis accents and you’ve got one remarkable insulated jacket and bib set. RefrigiWear knows you have to work hard in the cold, which is why we develop products that help you get your job done. Our new Extreme Softshell Jacket and Bib provide the protection you need but also the features you want in insulated clothing. Get more details and purchase the Extreme Softshell Line here: www.refrigiwear.com/extreme.